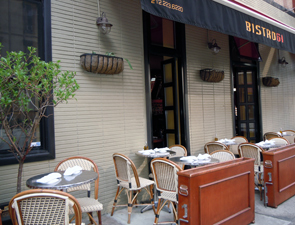 TravelsinTaste.com recently had the delightful opportunity to speak with Anthony Raggiri, owner and executive chef of Bistro 61 on Manhattan's Upper East Side. A native of Marseille, France, Raggiri learned to cook from his mother and grandmother. Before arriving in New York in 2002, Raggiri worked at Le Bistro Plage, a prominent seafood restaurant in Marseille; Chez Paul, an acclaimed French bistro in Paris; Lou Roustit, an innovative French/Italian restaurant owned by his family in Aix-en-Provence; Les Dauphins, a seafood restaurant in Marseille; and Le Rhul, a well-known bouillabaisse restaurant on the bay in Marseille. In 2002, Raggiri moved to New York to become executive chef at Isobel, an innovative French/Mediterranean bistro in Brooklyn Heights. In 2004, he opened Bistro 61. With such an impressive and extensive resume, we wondered how Chef Raggiri would describe his style, and how exactly he cultivated it. "[My style is] simple yet refined, or basically, simple and tasty," he told us. "I am a chef with a passion for the authentic French dishes of my heritage. Even though I worked many years in major Marseille restaurants, my long-term passion was to open my own simple yet refined French bistro in New York City. When I opened Bistro 61, I created a menu that featured classic Provencal dishes. I also added dishes from surrounding Mediterranean countries such as Spain, Italy, Greece and Morocco. I want to combine the classic with the new and innovative. I will always continue to update the menu." Chef Raggiri's love for the food of his homeland is contagious and no doubt makes its way from Bistro 61 into his kitchen at home. His favorite type of food to prepare there: grilled food. "It is simple and all about the food," he says of grilled cuisine. "The same as I am in my kitchen at work. Keep it simple. People should know what they are eating and eat healthy."